Marina Amaral, an award-winning Brazilian journalist, is a founder and owner of the monthly magazine Caros Amigos. She is also a founder and director of Publica (apublica.org), Brazil’s first nonprofit investigative journalism center. What could have provoked such massive protests against a soccer festival from the sport’s most passionate fans? 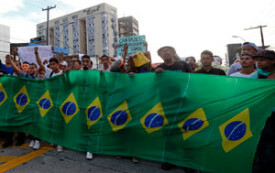 Why Are Brazilians Protesting the World Cup? Most Brazilians feel that the biggest football festival in the world, along with the foundation of their country, is being stolen from them.